In Charlotte Mandell’s latest translation of his work, Mathias Enard takes us to 1506, when a 31-year-old Michelangelo arrives in Constantinople, having been invited by Sultan Bayezid II to design a bridge. The Constantinople that Michangelo visits is a confluence of cultures: “the Empire was no longer Roman and not really the Empire; the city swayed between Ottomans, Greeks, Jews and Latins”. Enard’s novel is full of meeting-points: the bridge itself as a symbol, but also the drawing out of conflicting parts of Michelangelo’character (the frugal man who holds back versus the side of him that’s happy to embrace his new experiences), for example. There’s also a triangle (maybe a wedge) of relationships: Michelangelo is guided through Constantinople by a poet named Meishi, who comes to fall in love with the artist. But Michelangelo only has eyes for an Andalusia singer. You conquer people by telling them of battles, kings, elephants and marvellous beings; by speaking to them about the happiness they will find beyond death…Tell them about all of that, and they will love you: they will make you the equal of a god. But you will know, since you are here pressed against me, you ill-smelling Frank whom chance has brought to my hands, you will know that this is nothing but a perfumed veil hiding the eternal suffering of night. 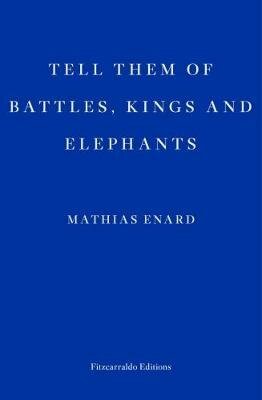 Tell Them of Battles, Kings and Elephants (2010) by Mathias Enard, tr. from the French by Charlotte Mandell (2018), Fitzcarraldo Editions, 144 pages, paperback (source: personal copy).